Thank you to Riley Blake Designs for giving me the opportunity to guest post and this amazingly gorgeous fabric. 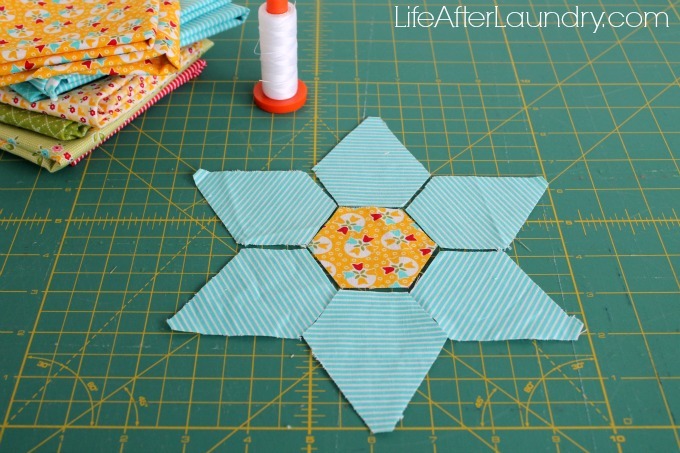 I’m so excited to be sharing with you a project that uses my new passion, English Piecing! I’m definitely new to piecing this way, but I have quickly fallen in love with the technique. There is just a certain charm that each creation holds, and not being tied to a sewing machine makes it very convenient for this busy mom. It has been rainy and dreary here in North Carolina for what feels like months, so this little Starpoint Table Runner is my sunshine right now. I can’t tell you how much it brightens my day to look at this, Bloom and Bliss, fabric line from Riley Blake Designs pieced together on my table. I love the small prints in this fabric line, to me it screams English Piece me! I love using acrylic templates to cut my fabric. It makes it so easy to cut through several layers with my rotary cutter, and I don’t have to worry about cutting into my template, like I would with cardboard. 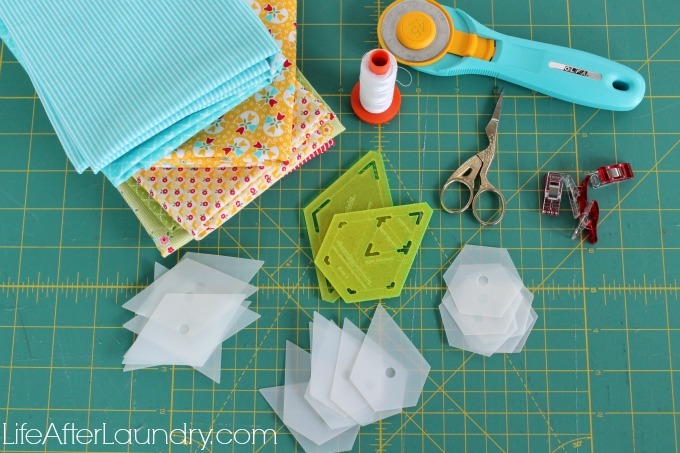 I also prefer to use Mylar shapes that I get from PlainJaneThreads. They are absolutely my favorite, my needle just glides around them. I love that they are sturdy and will last a long time! It is completely up to you, those two things have just become my English Piecing preferences. I cut a sets of shapes (6 starpoints and 1 hexagon) from 4 fabrics, and then switched up the center hexagons to add a little contrast. All of the fabrics go so well together, so this was very easy to do. I also cut 24- 2″ diamonds out of the solid white fabric. After my shapes were cut, I basted each one. I just go along the edge, stitching 2 times at each corner to secure and tying off at the end. 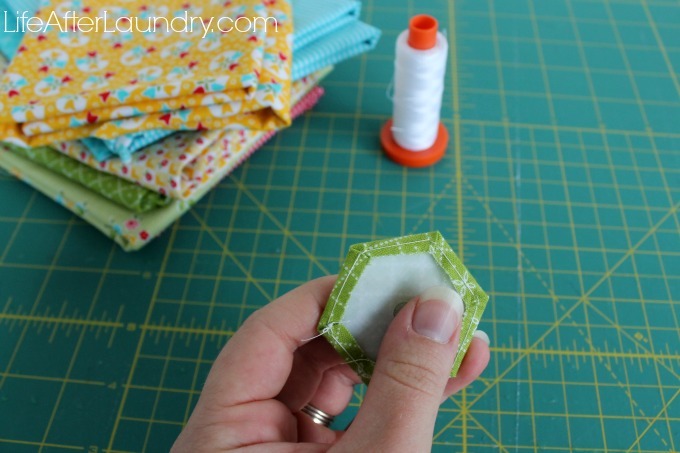 When my shapes are basted I start sewing them together. I always start and end my stitches with a knicker knot, Sue Daley explains it in this video from Riley Blake. I work along my edge stitching through both shapes. 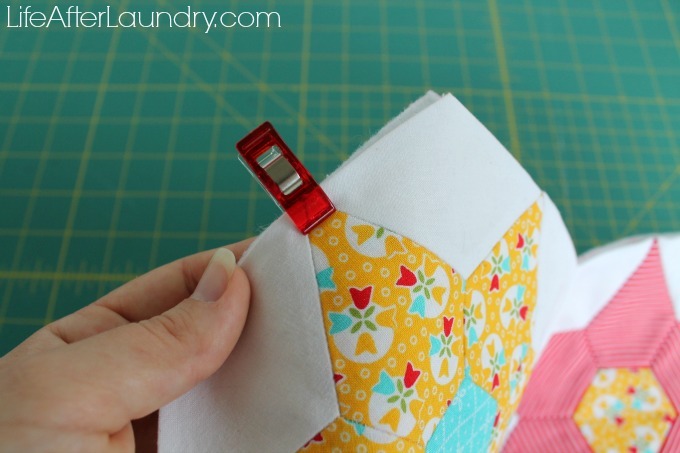 The Mylar shapes help you to grab just the edge and not stitch to far down. 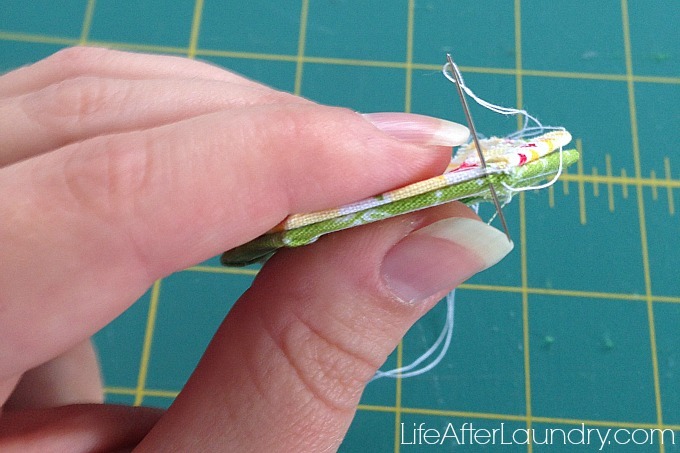 I also make my stitches very close together, approximately 1/8″ apart. I continue to piece my shapes together, taking out my Mylar pieces when all sides of a shape have been sewn together. 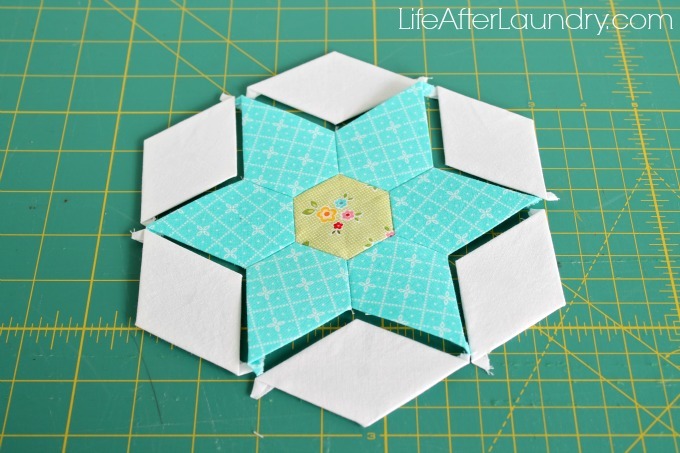 Once your Starpoint block is formed it will make the cutest hexagon. 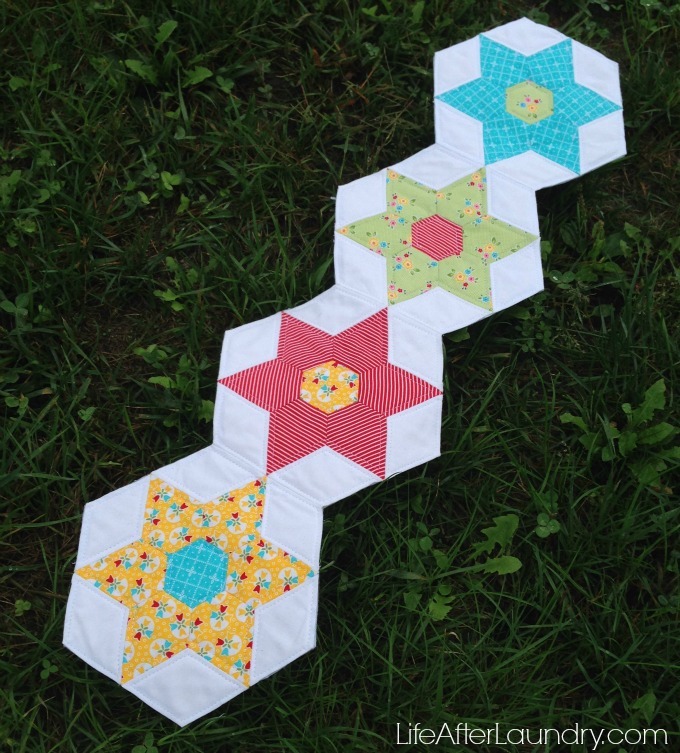 To make the table runner top, I just laid my hexagon blocks right sided facing and sewed them together using the same method as I did for piecing my block. I was so excited to see how my shapes looked all together that I forgot to snap a picture of joining the blocks, so I hope that explains it well enough. I really struggled with how to finish my tablerunner. 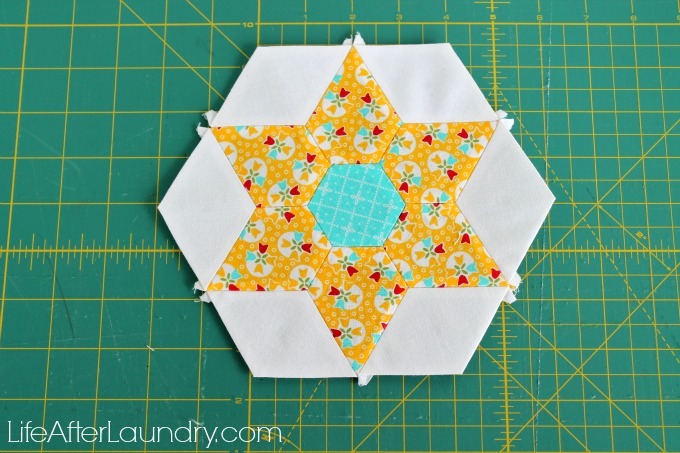 I didn’t want to bind the edges because I felt like it would take away for my pieced shapes. I searched the internet for ideas, but very few people share how they finished their English Paper Piecing project! After much debating I decided the best way to do it was to use felt as my backing. I knew the felt would not fray, and it would give me a clean edge without binding. Using the tablerunner as a stencil, I traced around the edge onto a piece of batting and my backing (the felt.) I trimmed the batting to be a little smaller than my top, about a half of a inch. That way the batting wouldn’t be sticking out of the edges. I basted my 3 layers together with basting spray, and I tucked in the little tails around my block edge. I secured these edges with Clover Wonder Clip, but you could also use pins. 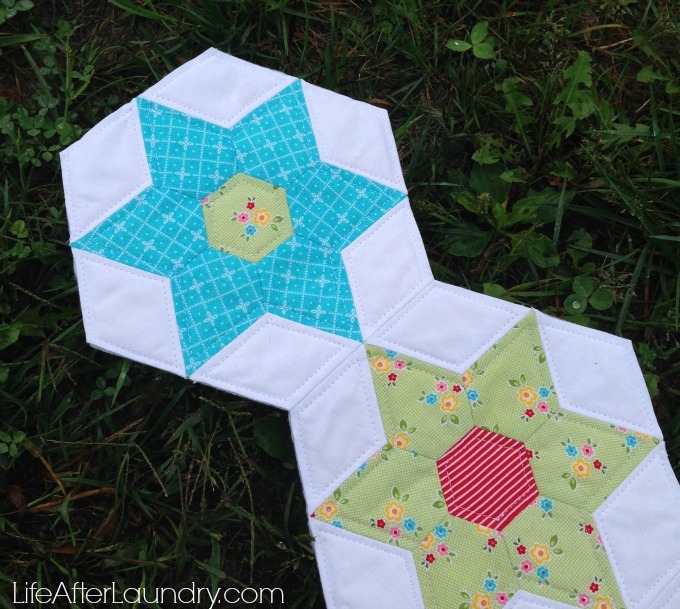 I simply quilted along the outline of my pieced shapes to finish my tablerunner. It really accented the design and was enough quilting to secure my three layers. Quilting around the shapes also enclosed my edges. 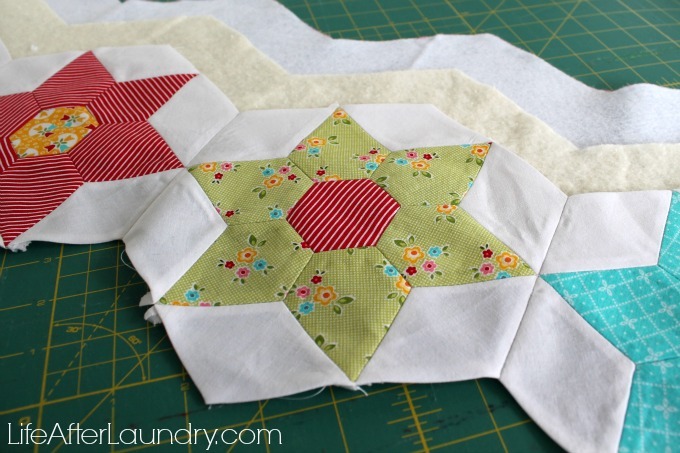 If you choose to quilt yours differently, make sure to topstitch around the outside edge of your table runner. After using felt as the backing for this project, I’m fully convinced this is the way to do anything English Pieced that isn’t a large quilt. Who looks at the back anyway? Especially on something that will be laying on a table, and if they do, they will still see the beautiful design my quilting produced. 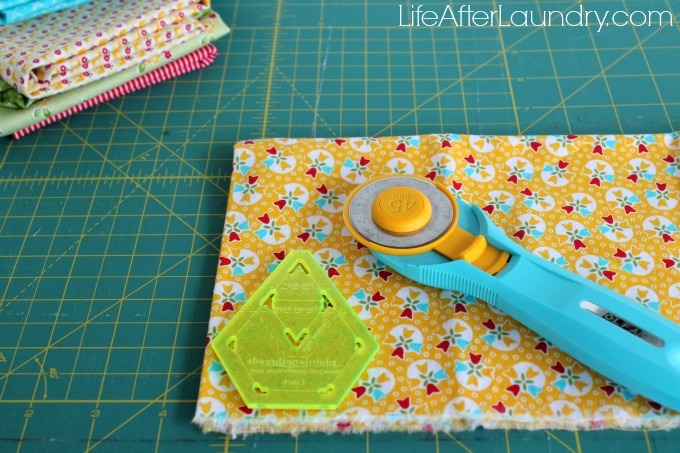 I plan to do some matching placemats, and adding a simple felt back will make the project so easy! I hope you enjoy my little project. Have you tried English Piecing? How do you usually finish your projects, with traditional binding or something else? If you have any questions please feel free to leave them in the comments. Thank you for letting me share my little project with you. If you would like to see more projects from me be sure to check out my sewing and quilting pages. Oh my gosh! I love this! So pretty. You did a wonderful job.